Gin Palace gin tasting - What's Katie Doing? 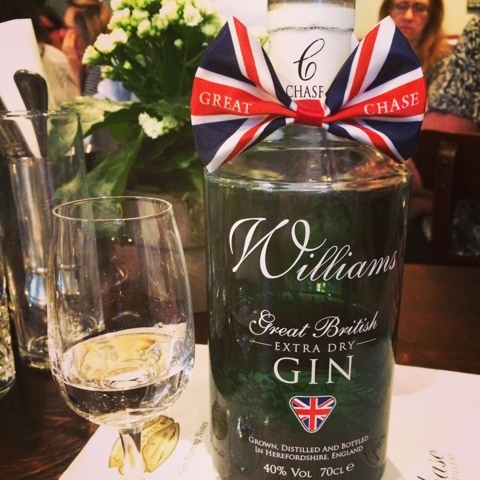 I was lucky to be invited to a special gin tasting event at The Clanchan last month, with Olivia Williams, gin expert and author of Gin Glorious Gin! 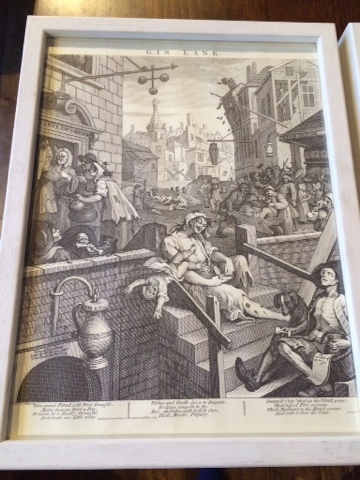 As he was commissioned by the beer industry to produce these prints, its not unsurprising that the people in Beer Street are happy and healthy, whilst those in Gin Lane are ill and imoral. 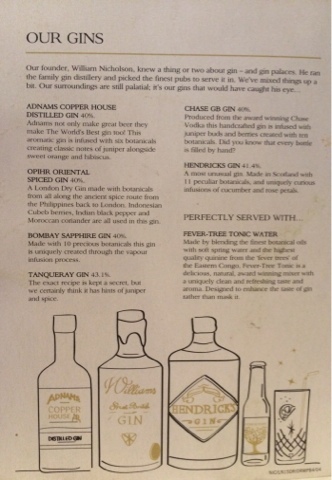 Then we moved on to trying the gins handpicked for the Nicholson’s menu, keeping in touch with their heritage. Nicholson’s actually started out as a distiller in 1873 extending credit to gin drinkers, which led to their growth as pub owning brewers, as they confiscated people’s property for defaulting on their gin bills! 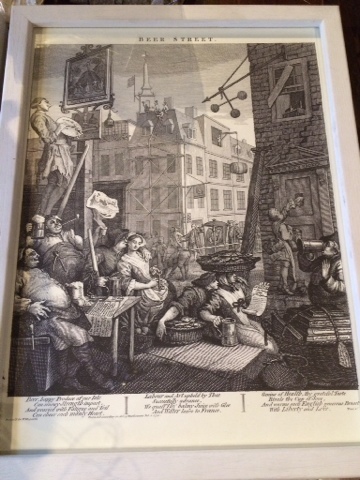 It also means that they have a lot of historic pubs including The Clanchan in Soho. Isn’t it a pretty menu?! This gin is made from a potato base spirit. 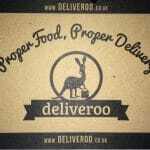 We learnt all about Will Chase and his extreme entrepreneurship, mainly centred around potatoes! His potato based vodka won awards, even though it doesn’t make money from it. The gin was made with an apple distillate originally and the Spanish gin market loved it, however they wanted a gin that would hold up to a large tonic or punch, the result was Extra Dry gin and Will wanted to make sure the British branding continued stood out! The extra dryness comes from using both juniper buds and berries in the distillation process. At The Oliver Conquest they serve this with a slice of apple to bring out the apple flavour, however Chase recommend serving with lemon and ginger to bring out the other botanicals. Its definitely a richer style of gin, a rich nose, followed by citrus zest and the warm spicy notes of cinnamon, nutmeg and ginger. The other botanicals include almond, coriander, cardamom, cloves, liquorice and lemon. 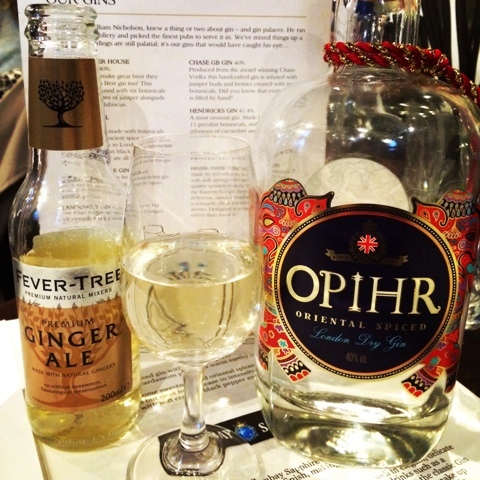 Next up – with the surprising twist of being served with ginger ale – was Opihr. 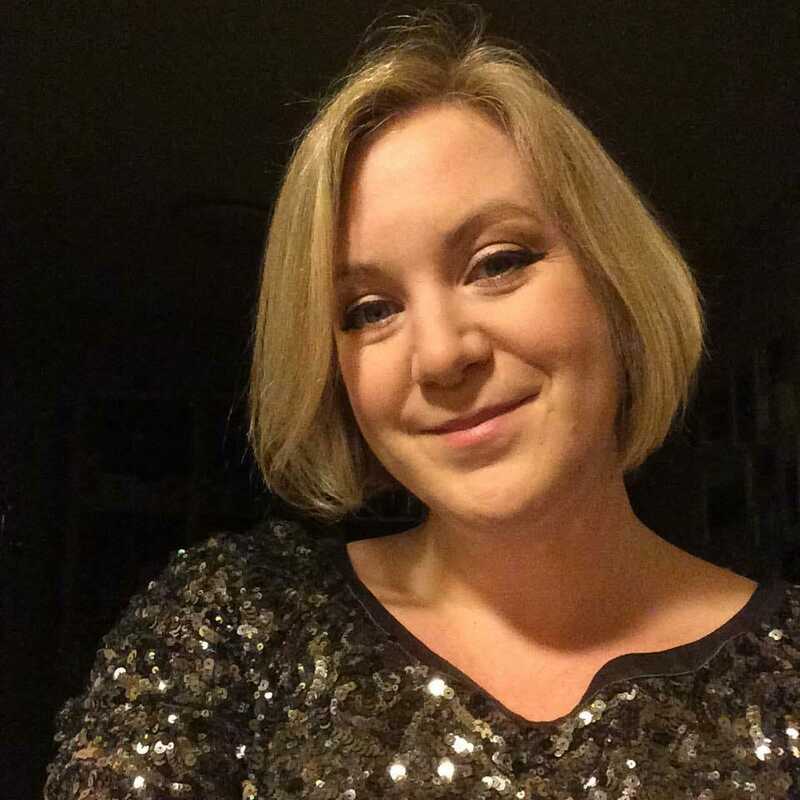 I love Opihr as something a bit different (well I actually like all of Joanne Moore’s gins, which include Bloom and Berkley Square). At the Oliver Conquest they serve it with a dried chilli garnish to bring out the peppery notes, which makes me wonder why I didn’t think of serving it with ginger ale before this, as its a great match! As mentioned this is made by the first female master distiller, Joanne Moore. The gin has a heavy cardamom scent with a hint of cumin and grapefruit. It has a sweet, almost sherbetty taste, with a warm mouth feel and a pepper and spice finish. This is one I recommend to people that don’t like a traditional juniper heavy gin, and with the ginger ale option I will now recommend it to those that don’t like tonic! If you prefer to serve with tonic, they recommend a ginger garnish, with the ginger ale an orange garnish. You can also serve with chilli or black pepper to bring out the spicy notes. Adnams is also an old brewery house that also makes gin. 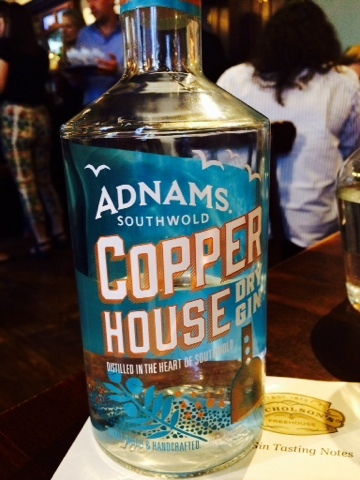 They use the Copper House distillery, where the old brewery was, hence the name. 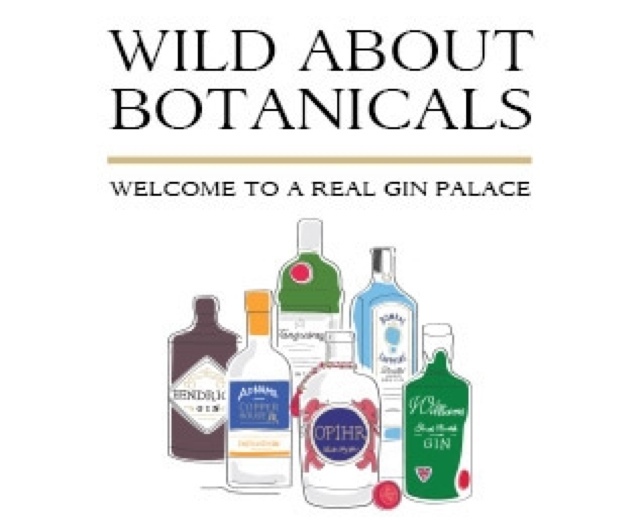 They use the London Dry method of distilling – all the botanicals need to be in the pot still to produce a London Dry gin, other methods that infuse the flavours in (like Williams GB Extra Dry) can’t be called London Dry. Adnams are very proud of their efficient brew house and distillery – the hot water from the distillation process is used to clean barrels of beer. The botanicals include sweet orange peel, juniper, cardamom, hibiscus, orris root and coriander. The gin has a clean citrus taste, and they recommend serving with fever tree tonic and orange peel. Again another easy to drink one! 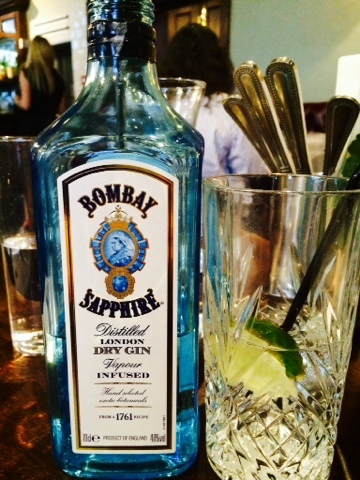 Bombay Sapphire can be credited with bringing about the new style of gin, vying with vodka for market share. The Bombay dry in a white bottle traded until the 1980’s, when the change in the product came about and the iconic blue bottle was introduced with the new flavour, and what a marketing idea that was! Even my mum bought it as she thought the actual gin would be blue lol! The new gin had two more botanicals in it – peppers from Java and Indonesia that add a floral resonance. The gin has citrus and pine on the nose, the lemon flavour from the coriander seed. On tasting you get the combination of almonds and a spicy sweet earthiness, the combination of cassia bark and liquorice. The distillery at Laverstoke Mill is all about the ecology and is aiming for zero emissions in 5 years. They start by buying the grain rectified spirit in, and use good quality botanicals, all fresh which is the best level for their flavour profile. 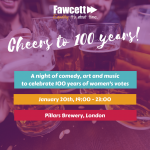 Laverstoke is set up for visits, so Gin Club has it on our list of outings! 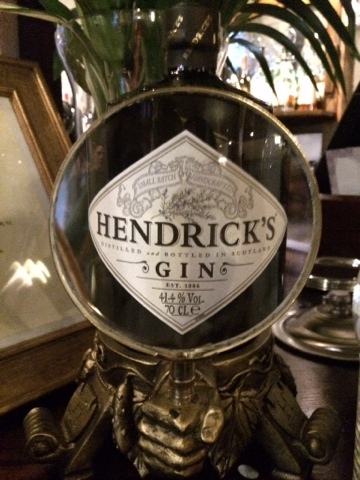 The other two gins on the Nicholson’s gin menu are Hendrick’s and Tanqueray – another two good choices for a well rounded gin selection. 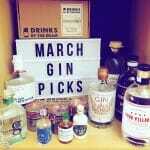 Hendricks is known for its cucumber & rose flavours and Tanqueray is a classic London Dry gin. 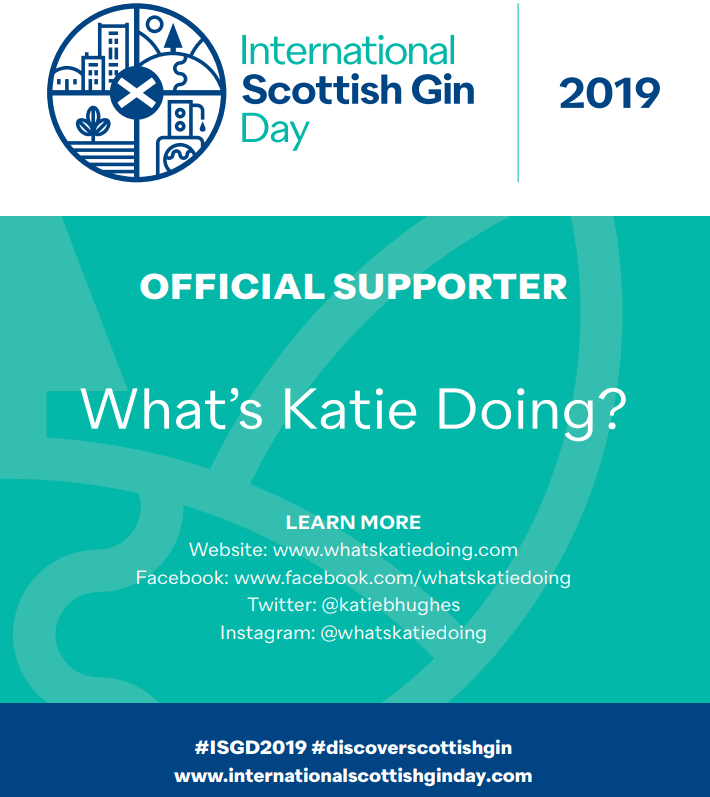 All in all its a great capsule gin collection – perfect for the beginner or the gin aficionado, especially with World Gin Day just around the corner on 13 June 2015, what better excuse do you need? 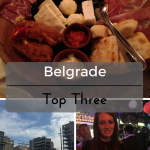 Go on, try them all and let me know which one you prefer!